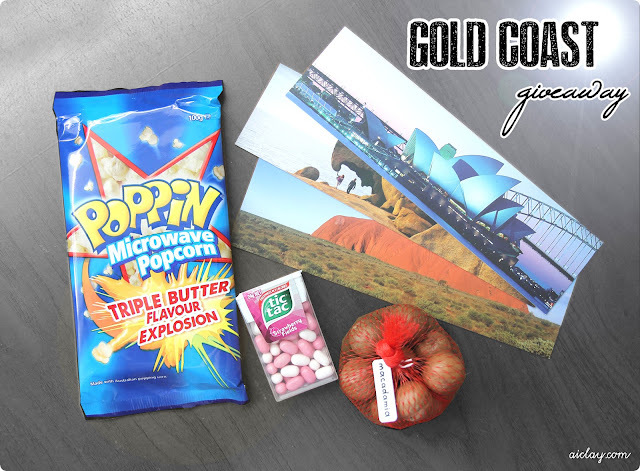 AiClay - a Haven of Miniature Food: Gold Coast Giveaway! I've got presents for you guys, from Gold Coast! Well, for one of you at least ahem. I have a habit of visiting supermarkets everywhere I travel and spending ridiculous amounts of time in them. Does anyone else do this? So don't be surprised that most of the items I got are from Woolworths/Coles. I did think of bringing back chocolates as well, but I was afraid that they might get squished/melt in the post. So I sourced specifically for products safe for mailing. Included in the giveaway: Poppin microwave popcorn, Strawberry Fields tictac, a bag of raw macadamia nuts and some pretty bookmarks. The little red bag for the giveaway contains about 8 nuts, as the shells + nuts pack quite a bit of weight so I can't put more in sorry! We visited the macadamia nut farm in Gold Coast, and I asked the lady at the store, "Can I go see the macadamia trees?" "Sure, just go around the back." Me and my brother went and searched around for a good few minutes but did not see any, only plenty of lime plants. Or so we thought. Turns out that the green fruits were actually macadamia fruits, and not lime, silly us! They were lying scattered on the grounds everywhere, and we picked one up and squeezed it open in the car. And oh yes, there was a macadamia nut hiding inside! This give-away is for readers worldwide, and I'll be paying for shipping of course. Easy-peasy. Just complete two steps this time! 1. Like AiClay's facebook page if you haven't done so. A lucky reader would be picked in a week, by 22nd July 2012, good luck! Psst, tips for nut cracking after the jump! 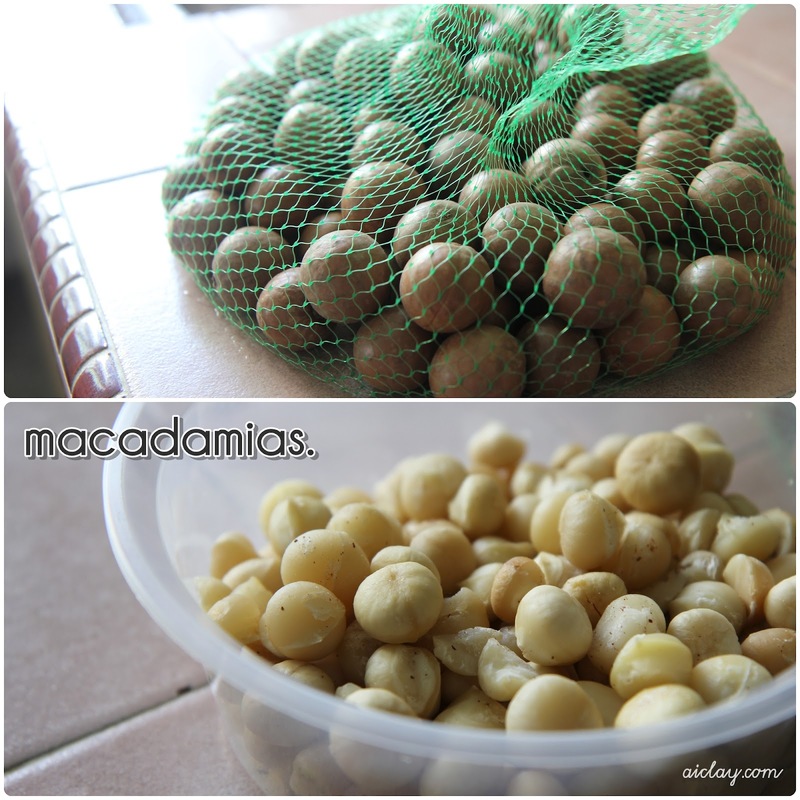 Since my family has been cracking the bucketloads of macadamia nuts that we lugged back, here are some tips for getting them to open. 1. Use a clean cloth to wrap around the shell, so that they don't fly off when you hammer them! 2. Cover your head if they do fly away, the shells are rock-hard and hurt like crazy. 3. Listen for a definite crack with every hit of the hammer, you don't want to smash the nut inside! 4. Once there's a crack on the shell, hammer it gently to get the shell to crack all the way. 5. Eat these nutty babies fresh from the shells, they taste best this way! My name there is Ladipo Leonard! Funny thing is that when I go to different places I like to look at their news papers see what is important to them as opposed to where I reside. But, I do love a good supermarket search, getting products that I can't get where I live is the absolute BEST!!! Heheh, I don't need to enter the give away, but lots of luck to all who do!! There are macadamia nuts from my uncles nut farm in my fruit bowl! To crack the nuts more easily, search for in indentation in a concrete path or step to help hold the nut in position. Look at the nut and you'll see a crease running from the top to the bottom of the nut, place the nut in the indentation with the crease facing upward and hold the nut in position with your thumb and forefinger, be sure to hit the crease with the hammer. This crease is the "sweet spot", you won't have to hit the nut so very hard if you make a direct hit on the crease. I would get my angry birds game set out and fire at those pigs!!! I'd put the nut in front of an approaching stampede of llamas (because I love em, so dang cute!) and hope for the best. Ah, I'll use some chants to summon lighting. Maybe even without those chants, I can crack'em..... just with my off-toned voice, maybe even the insides is smashed when the shell is cracked. I'll throw them in a mortar and pound them lightly till it cracks! Pretty packaging & le winner! How are you quacking this Friday? I want to eat durians so bad! finally, i'm spilling the beans.